While a bipartisan committee endeavors to drive to a compromise on a comprehensive transportation bill balanced between the positions of Democrats and Republicans, states across the land are locked in a race to fund the repair and maintenance of state highways, bridges and roads. The gridlock some of us experience in our daily commute is merely a microcosm of the gridlock that seems to be paralyzing our government. Lawmakers need to come to common ground on the Federal transportation bill that has already been temporarily extended nine times. Meanwhile, in Oregon and Minnesota, a tax on mileage has been enacted, which may solve the funding problem, but nobody really seems to think it is the appropriate solution to the problem. The states have all been strapped since the economic bubble burst and all the bonds and projects based on the perpetual growth of tax revenues were quickly shortchanged. Add to that the effects of moving to more fuel efficient vehicles – the revenues from the tax on gasoline are no longer meeting the requirements of state road maintenance. Consequently, Washington and Nevada are also considering such legislation. So quickly did revenues fall, many states cut employees and services to the bone, while general funds were depleted and some are still facing shortfalls that negatively impact keeping basic services like schools, fire stations and police operating. In a move that spurred a recall movement, the Governor Walker of Wisconsin revoked collective bargaining for state employees, simply because the state could no longer afford to pay them their current wage, let alone cope with raises or a worker walkout. It would seem the people of Wisconsin accepted this assessment as they refused to remove him from office. According to Alexis de Tocqueville, author of Democracy in America, our republic has some adverse aspects built into the system, including a tendency towards the majority’s tyranny over acceptable thought, a preoccupation with the material world and a consequent isolation and alienation of individuals. He predicted the current violence and vehemence of party spirit and how the prejudices of the ignorant could shout down the judgment of the wise. In Maine, the roads are begging for repair funds and money for the maintenance of bridges. The state legislature’s Transportation Committee has asked for help from the Maine General Fund, but the Appropriations Committee is not fond of that idea. He went on to say the problem would just grow worse without action and that the state could no longer rely on the gas taxes to fund road maintenance. In Michigan, Dave Alexander reported on Mlive.com that the congressional battle is about earmarks in the eyes of U.S. Rep. Bill Huizenga. The Federal transportation bill determines funding for road projects, but also involves critical maintenance of harbor maintenance projects. Shipping on the Great Lakes is an important part of state commerce. To some extent the battle over earmarks is generational, with old school legislators insisting on pork barrel projects and newer members opposing such largess. Another sign of the problem comes in the fact that the $6 billion to $7 billion Harbor Maintenance Fund has been raided to cover the general budget deficit and redirected funds meant for annual dredging projects in the Great Lakes. 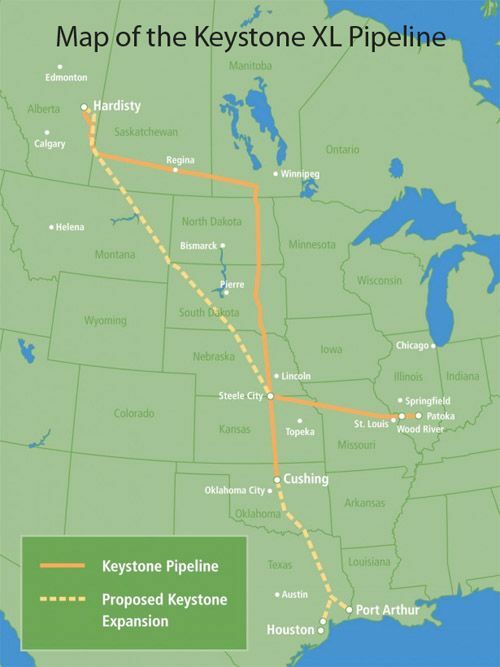 One of the most contentious aspects of the struggle is the Republican support of the proposed Keystone XL pipeline, touted for the jobs it will create and its downward pressure on gas prices. Critics counter the jobs it creates are only temporary in nature and it would ultimately result in upward pressure on gas prices. It also poses a threat to natural aquifers our agriculture depends upon, violates treaties the U.S. signed with the Sioux Nation, and takes the public on a wild ride from which only the Canadian owners of the crude tar sands and the associated refineries in Texas will see any part of the gravy train. According to Swift Midwestern refineries get 22 gallons of gasoline out of a 55-gallon barrel of crude. Contrastingly Gulf Coast refineries produce only 17 gallons from a barrel – the difference adds up to an estimated 1.2 billion gallons of fuel annually. The article also quotes Ian Goodman of The Goodman Group, an economic researcher and co-author of the report as adding, “Crude prices in the U.S. Midcontinent are now substantially below prices on the Gulf Coast (based on the global oil market). In effect, the U.S. Midcontinent is getting a discount, because it is now close to the source,” he said. According to Goodman, the purpose of the pipeline is not to lower the price Americans pay for gas, but to increase Canadian profits by selling diesel on the global market, thanks to Texan refineries close to Gulf ports. So smart businessmen that they are, they’ve been seeking the support of our government to bypass environmental concerns, treaty obligations and other red tape so the fats cats can get even fatter. Then the American public will be repaid for selling out our environment by paying a higher price at the pump. Has everyone forgotten the BP Gulf Oil Spill so soon? Selling American crude on the global market is a good thing, but will we hand over a despoiled world to coming generations for the sake of a few temporary jobs and a chance to let the rich get richer at higher costs to us? Disclaimer: This story is individual opinion and does not necessarily reflect the views of Torque News. The real problem is that we have three taxes that are used against vehicles, but only one of them actually funds the infrastructure that vehicles use. Interestingly, the states with high gas taxes seem to be the ones with the most problems funding their own roads. Those with low taxes (like, say, mine) have dealt with any under funding quickly and without debt-based budgets. This implies two things: First: states with lower taxes seem to have a better idea of how to deal with budgeting and don't tend to have overpaid or top-heavy bureaucracies - at least, when compared to states that have higher taxes, since "overpaid" and "top heavy" are relative terms). In other words, states with lower taxes seem to be more fiscally responsible. Second: the two taxes against vehicles that are generally not paying towards roads are automotive sales taxes and annual property tax assessments. It would seem obvious that at least the annual property tax charged for owning a vehicle should be spent towards roads. In most states, it's not. Finally, a lot of state and federal DOT funds seem to get spend on things that don't impact roads much. For instance, in Utah a few years ago, they spent a lot of money on a commuter train that, frankly, has had little to no impact on traffic and is very under-utilized. Studies not funded by those pushing for the train found that it would be this way. I think we expect way too much out of government as if it's some kind of Superman that can accomplish anything. Most of the time, given its track record, it accomplishes little with the resources given to it. I think some of this "austerity" in government is a good thing. It may help wake some people up to the fallacy of looking to government to right all our wrongs when, in fact, many of those wrongs are due to government itself. Comments on a page about the Oregon law were largely about what you're saying. One woman asked why she should pay more taxes so some bureaucrat could spend it lolling about in a hot tub in some foreign country. That's why I was quoting De Tocqueville. There is nothing in our system to prevent corruption and without public oversight it grows just like mold in the damp. Public servants being arrested for misappropriation is becoming so common people hardly notice. Apathy and disinterest are the enemy, along with grossly uncivil discourse.